Midwest Skijorers Club puts this equipment to the test. Ultra Paws Basic Skijor Package - Skijor belt ,Towline, Harness. I recently had an opportunity to try out the Ultra Paws skijor package under a variety of conditions. There are a few very unique features on the belt which is the only patented skijor belt. The belt is now available in 5 sizes: XS, S ,M, L,and XL. The belt is wider than some other belts for maximum support and the extra widtht provides excellent distribution of forces. The inside of the belt is a tacky material that is designed to hold the belt in place without leg loops. IT DID AND DOES STAY PUT. It stayed in place on jeans, on lycra, on nylon wind pants and on running shorts. Note: Running shorts means I also tested it in a canicross venue. Even while on the ground, with forward pulling forces (think after a fall) , the belt stayed in place and did not ride up or slide down. It did not shift left or right but stayed centered when turning corners. Note: Depending on clothing fit, the clothing can move but the belt stays put on the material. The belt is equipped with a soft quick release which is hard to describe but is essentially a velcro "hook and loop" arrangement (in emergency "pull the red rope"). With this soft release, I never once experienced an inadvertent or accidental release (which can and does happen with panic snaps and snap shackles). Furthermore when I wanted it to release, it released and it released completely (which also does not always happen with snap shackles and panic snaps since they work much better with a ring, and can and often do get "hung-up" on the rope). The belt has a secure 1 1/2" double slider "Fastex" buckle so that the buckle and the belt stays centered where it feels the best. The double slider is like those used on quality backpack waistbelts. (Very few, if any, other skijor belts on the market use the double slider, so most other belts only adjust uncomfortably to one side). The belt has 2 reflective strips for night-time or low light visibility increasing safety for the wearer. Another unique feature is the extremely handy built in control handle on the back of the belt. The handle is designed for a handler or helper to assist you when starting out or in a race chute. (And yes, you should definitely always bring at least one handler that your dog knows and likes to help you start any race). This is an awesome addition. I also tested the 8 foot one piece 2 dog towline. The towline is made of a durable 1" tubular webbing. The towline has a high quality military grade arctic bungie is sewn into the webbing. The bungie is at the human end so you can easily reel in past the bungie for much better dog control. (with a bungie at the dog end you do not have full control until 100 % of the line is reeled in and you are holding the harness) The bungie is inside the tubular webbing and is sewn only where it needs to be, so in time if the bungie breaks or the sewing lets go, the web towline is still fully intact. This is a HUGE benefit. There is no sewn rope to break and therefore no fear of having your dog get loose and in harms' way. And with the line remaining intact you finish the race. This "line stays intact design" is definitely a WIN-WIN idea. There is 16" of bungie material incorporated in the tubing, which was more than adequate (without having excessive stretch) and provided a comfortable ride in varied trail conditions. Ultrapaws still uses a high quality brass snap on their line. Some of the other manufacturers/distributors have switched to less expensive (cheaper and lower quality) snaps. The tow-line also features an 8" loop near the quality brass snaps, to be used similar to a leash for better control closer to the dog. 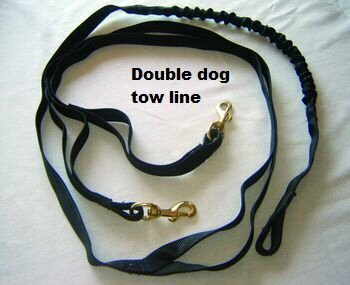 The towline loop can be used at the start or finish to keep your dog close (and calmer). The tow line loop can also be used when you need to reel in line and control your dog to ensure successful no-contact and interference-free passing. The One-Harness is available in 3 sizes and is adjustable for a growing youngster or one that may gain or lose weight easily. An adjustable harness may seem like an additional task but considering the high volume of improperly fitted harnesses that are in use (many of them brand new and right from the sales floor), it would be beneficial to the dogs if other harnesses had some adjust-ability. The One harness is a 3/4 length harness not as short as a guard , distance or shorty harness but not as long as an x-back or h-back style. The One harness has a built in belly band (also adjustable) to prevent young dogs from learning to back out of harness. Being adjustable the One Harness would also be a good harness to carry as a spare. If you lose a harness or a dog chews his harness, an extra One Harness will likely fit any dog in your team. Another benefit of this harness is the opportunity to pay it forward and share the sport. You know, when some one sees you out playing, and says that looks like a blast, how do i get started, how do I know my dog might like it, (now here is a spare adjustable harness that will probably fit or adjust to their dog so they can quickly and readily see the possibilities. Sharing an adjustable harness (along with some real tips and training) could be a great pay-it-forward movement for dog powered sports. This Non-Stop Dogwear Comfort Belt is a belt with leg loops and would probably fit in the category of belts referred to as a wrap design belts. While it is a wrap design the back is mesh which is extremely light weight and very comfortable. The Comfort belt is appropriately named as it is by far the most comfortable belt with leg loops that I have ever tried on. It has a double slider fastex adjustment. Being of European design it has a hook rather than any type of mechanical quick release. With a hook there is absolutely no pendulous weight whatsoever between you and the dog. Europeans used hooks, they have tried snapshackles and other various releases but have went back to the tried and true and reliable weight-free hook. I saw variety of hooks in use in Norway. Some belts use a simple bend configuration, some a little more complex bend, Non-Stop uses a simple design that holds the towline very well yet it easy to release in a very reliable fashion. It is hard to argue with the beauty of simplicity, efficiency, function and comfort. The Non-Stop Dogwwear Free Motion harness is a very well designed and extremely durable harness. It is very well padded, (great for short coated dogs) and is anatomically correct for function and comfort. It provides excellent air exchange and range of motion. 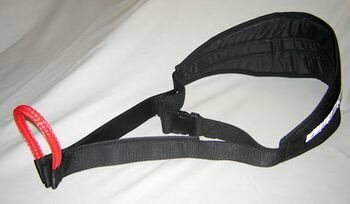 It is a 3/4 harness and has is adjustable in the length and in the rib cage. The Free Motion harness is also available in a "Combined" model for the pulka and combined events. 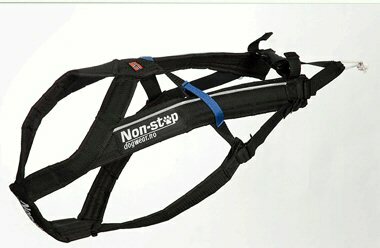 Non-stop also makes a great X-back harness. The Nonstop Tow-line is constructed of a lightweight webbing and has an integrated heavy duty elastic "strap bungie" The 1 dog line has a small loop on the webbing of the towline that allows you to easily add the modular adapter to make it a 2 dog line. *** Interestingly the assembled 2 dog towline creates tuglines which are 24" in length or about 1/2 as long as most North American skijor tug lines. The beauty of these short tuglines is there is far less chance of tangles and when not using a neckline the dogs cannot spread across the trail (causing interference) like they can with our much longer tug lines. In short the Non-Stop Dogwear equipment is light weight, durable and well designed with common sense for comfort, efficiency, functionality, and high performance. 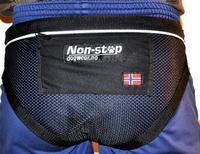 Non-Stop Dogwear equipment is the most popular gear in Scandinavia if not Europe and Non-Stop equipment is what the International Nordic sports' Champions and leaders use. Get On The Ball, Stretching The Performance Dog and Strengthening The Performance Dog - this dvd series by Debbie Gross Saunders is just what a canine athlete needs to be in perfect shape for the approaching skijor season. MSC member Vicki is currently putting her dogs through the paces and documenting the results.